I was going to post this card days ago and never got around to it. I really fell in love with the size of this card. It's sized to fit in a regular mailing envelope and even though you can only get one card out of a piece of 81/2x11 inch card stock I think this will be the size I use most of the time. When folded this card is 31/2 x 61/2 inches. I just have so many ideas that go best on a thinner card. I used some colors that I thought I would never use. I have never liked the thought of using very vanilla until I bought some that is and now, I never use Whisper White. The other colors are Pumpkin Pie, More Mustard and Really Rust. They Weren¢t my favorites either but, I love them now and they go so well with the new Basic Grey paper. I used my super cute brads I got from the Oriental Trader and the bestest Wally-World ribbon ever. I also used some Stampin' Up ribbon. Just to let you all know I do not have a Cuttle Bug so the embossing is done on Fiskars texture plates first with the Fiskars tool and then with a stylus. I have to say my hand did hurt by the time I was done but, I got the look I was going for. 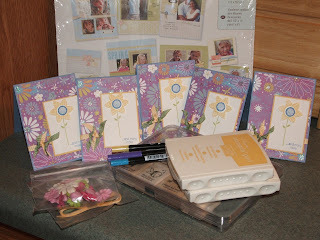 And last but not least is the stamp set; it is YOU MAKE ME HAPPY and yes, it does make me happy. I didn¢t like it at first but, now it sits at the top of my favorite pile. Advice Please! The Terribles Two's! Can anybody tell me what to do with the worlds most defiant child. Ava is a sweet kid when she need to be but, when there is no need and there is nothing she want’s nice and sweet go out the window. Ava screams in my face and runs from me when she knows I can't go after her. She waits until I sit down to feed her brother to jump off of the stairs, run out the front door in to the street, mess her pants and pull food either out of the refrigerator or the trash. And this is just my morning. Now, it 's time to eat so, Ava takes this time to make her biggest messes. Food on the floor, in her hair, on her clothes and then when she decides she is done the plate hit’s the floor. I have to laugh while inside I feel like I have lost complete control and if I don’t laugh I am going to have a break down. At times I feel like I am going to implode. Now comes the worst part of the day……… bed time. Some nights I put Ava into bed nine or ten times. I have to be honest and say that her behavior impart is my fault. I will blame some on her age but, the biggest part of why she is the way she is, is the lack of communication and team work between my husband. I need help before it's to late and I can't repair the damage that has been done. I am so scared that she is going to get hurt. Ava came into this world screaming her head off and had figured out defiance by the time she could crawl. 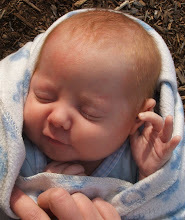 I was worried that there was something wrong with my little girl because when you would talk to her she would close her eyes real tight, so I asked her doctor and she said, "No there is nothing medically wrong with her. The only thing wrong was that she doesn't want to listen to you. Plain and simple she is being defiant. Good luck with that one!" And those words are burned into my memory and I think that I should have sought out help then! 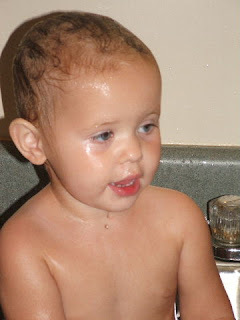 So dose anybody else think that this is a simple case of the terrible two’s or do I have a real problem any comment with helpful advice or just words of encouragement would be great thank for reading! So, we all know how great kids are and how challenging they can be . Let me show you in word and video just how crazy my kids are. It starts like this; it's dinner time and everybody is sitting around the table eating except Ava, she is playing in her food talking to as if it were a person. 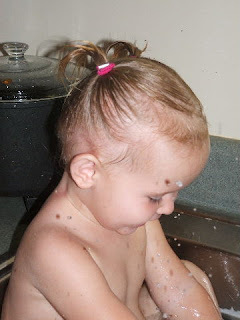 She would say, “ Washy washy, washy,” as she mashed her food between her chubby little fingers and move it from one place to another. She even tried to feed it to Baby, her blanket, that go’s every where she does even the dinner table . Ava some how figures out how to dump a spill proof cup into her food to make it mushy and every few seconds you will hear her say, “ Whoop" and then you hear a plop as a fork full of her food hits the floor. All the while her brother is crawling around on the floor below her. 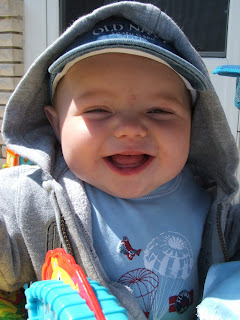 Now, this kid is a eater and he lets you know that if you have food he wants it. So, I took the time to get the camera and try to capture Ava playing with her food with out her seeing me….. but she does and it is on from there. She says, “Want see Aba, want see cheese.” This is how she refers to herself and the picture display on the camera . Then she decides that she is done eating and wants me to take her plate. Well, before I could grab it from her it hit the floor where our “baby Henry” crawls faster than I have ever seen him move,grunting the hole way, to get the food, . When he makes it he eagerly grabs large chunks of chicken and shoves them in to his cute little face. It was all I could do to not drop the camera trying to get the chicken from him so he doesn't choke to death. 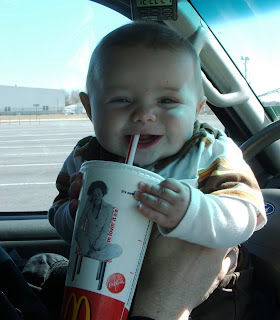 Mind you he is 6 months old and hasn’t even got his first tooth yet but, he was not going to let that stop him. To put a picture to the mayhem watch this video enjoy!! This is a gift set I made for a 7 year old girl in my daughter Jasmines class. Yes, I said 7. I know that I would like to get something like this for my birthday so, why not a first grader. The stamp set is very punny and one of many scrapin' packs that I had, along with some ribbon, prima flowers and some markers. I think that I might make a bag for all of this but not til tomorrow I've got to get some sleep some time. Now for the cards; the DP is DCWV and the card stock is so saffron, (my favorite of all the SU yellows), and brocade blue. 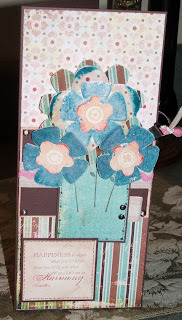 I used the You Make Me Happy stamp set from the spring mini. Alright I love this card. I can't get a picture that does it justice and that makes me sad . I made it for my mom who was kind of sad the other day and I thought I would try to make her smile. I think it worked she sounded happy about it. Any who, this was for the SC115 on SCS. To start with I used Chocolate Chip for the base of this 9 1/4" x 4" card then topped it with Basic Grey Blush series DP. The center panel is Choc. Chip and Confetti Cream. I used Craft, Teal, Blush, and Real Red card stock for the Big Bloom (my favorite stamp set ever) and then coated them with ultra thick embossing enamel that I heated them from the bottom to prevent the same mess I made last time. I still can’t get that stuff off of my stove. 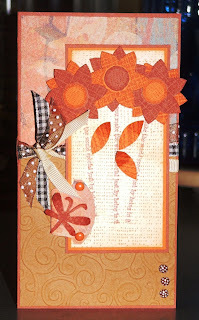 I used versa mark on the DP blooms and embossed them the same way. I love, love, love the way it turned out. I bought the ribbon and ricrac at Wal-Mart they are great for that kind of stuff . 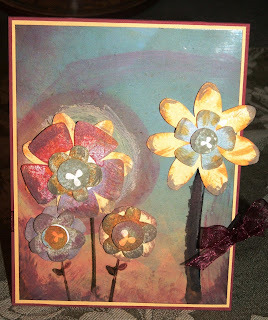 I got the idea to emboss the blooms from this card Leslie Miller made with Big Blossom you can see it HERE she is an amazing card maker. 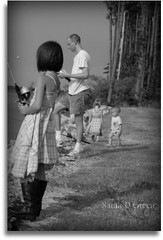 Thank you for visiting and checking out my blog. This is a card I made for my first swap that was not put on by my mom. Yes, her swaps count but, I am striking off on my own and having fun doing it. Hopefully this swap will give me a lot of god ideas for when I start having my own demo parties. This is a 3"x6" pocket card. 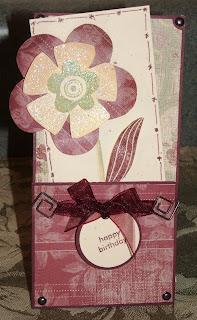 I used Big Blooms and Amazing to Zany stamp sets, Bravo Burgundy and Confetti Cream card stock, and Recollections DP. The flower is three layers of Big Blooms. The bottom flower is DP and the other two are done on Confetti Cream with craft ink ,coated with Dazzling Diamonds and then sprayed with a matte sealer. I then popped them up with dimensionals. I finished off the card with some doodles. I really hope the ladies like it. Thank you for visiting, please leave your feedback! 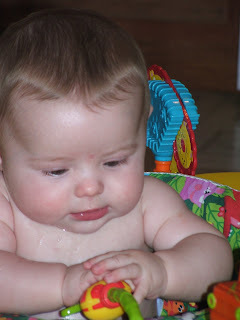 Well, it is nearly midnight and I am sitting at my computer once again because my son, the best little man in my life, won't go to sleep. He is laying in his bed making noise and it seems to bother nobody until I go to bed. What's up with that? Where does that leave me, well it leaves me here with you. I thought I would write my first entry in my new blog . It is all about this card I made for IC66 at SCS. I had so much fun making this card I didn't know when to quit. I don’t really like the ribbon but, it's to late to remove it now. I hope you enjoy and thank you for reading my first blog.